SOLD- WAS: $64.00 NOW: $50.00 This choker is a stunner! 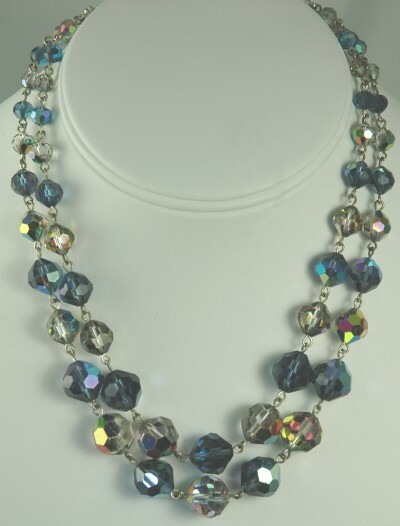 The aurora borealis crystals are beautifully faceted glass rounds and they show a rainbow of color. They graduate in size from 12mm down to 5mm and they are connected via silver- tone jump rings. This is an adjustable necklace that closes with a hook. Part of the clasp section is set with shimmering clear ABs that are in a rhodium plated backing. Dazzling! Condition: Excellent vintage. Minor wear to AB coating in a few spots as expected from age and use. Measurements: Longest strand 13 1/4" and the other is 12". This choker is adjustable by another 2".